Flexible working, crèches, more generous maternity leave and tackling unconscious bias are just some of the changes that are helping Unilever attract more women, but Aline Santos wants to go further. Santos, the FMCG giant's global head of diversity and inclusion and executive vice-president of marketing, was eager to tell Campaign about the progress the company has made since chief executive Paul Polman set out a course towards equality eight years ago. 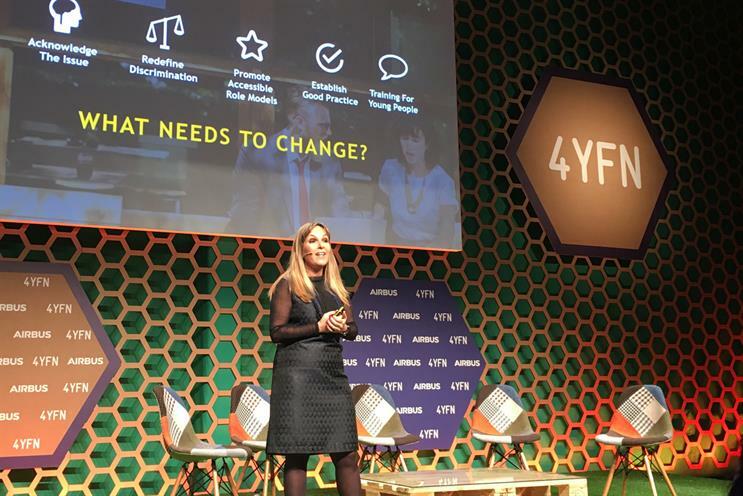 She was in Barcelona, at Mobile World Congress, to extend the mission to the way Unilever works with start-ups with the announcement that its Foundry incubation lab was committing that 50% of the start-ups it works with will be female-led in the next five years. "Diversity is the mother of creativity, and if we have a pool of richly diverse talent, ideas can come from everywhere," Santos said. "There’s still a long way to go to close the gap, and we have to be in still better shape if we hope to lead the market." The first, big, important step came from the top, according to Santos. "Everything starts with leadership. It’s no coincidence that our numbers [of women in management] started to rise when Paul arrived in 2009," Santos said. From the beginning, Polman insisted that Unilever needed to change the way it was organised to achieve gender equality. "Having a beloved, eloquent leader like him setting the goal of 50/50 men and women at Unilever was a very important moment," Santos said. The next step was to look closely at Unilever’s policies to ensure they are helpful in helping women succeed in their careers. "He said: ‘I want to see the numbers. Start measuring. We measure what we treasure.’ This ensured we could chart our progress moving forward and what was making a real change," Santos said. Unilever’s senior management team (which has gone from 38% female in 2009 to 47% today) studied the market for the most progressive policies. Working with institutions such as Catalyst, Insead and Harvard, the company started to incorporate their research into its policies. "Flexible working is crucial and not just on paper. What matters has to be getting the job done, not how you do it. As long as the employee is committed to the outcome, it doesn’t matter if they’re working during working hours, weekends, or nights – it’s their choice. If I need time during the work day for a family matter, I can just go. I don’t have to justify," Santos said. While it’s true that policies are not the same as culture, they mark the beginning of change. "Policies give you the right. When you have something written, it’s published, it’s visible and public and it gives you the right. You feel entitled to follow that policy. If it’s not clear, then it can be interpreted in different ways that don’t force cultural change," she explained. Another major initiative recently pushed through in late 2017 was to extend Unilever’s minimum fully paid maternity leave to at least 16 weeks around the world. "We found that 54% of the markets in which Unilever operates didn’t have maternity leave periods of a length that we believe is right. We wanted to offer, independently of local rules, at least 16 weeks fully paid. By giving to women what we believe is right, we hope it will help more women join Unilever," Santos said. It’s also important to the company that there is either a crèche in its offices, or access to ones near the building. This, combined with rooms where women could pump milk and store it in dedicated fridges has helped new mothers feel welcome and included in the company, Santos said. With the policies starting to fall into place, it was time to tackle unconscious bias. "We all have unconscious bias. It’s part of our nature. It’s conditioned into us since we were little babies and while these biases can protect you on many occasions it can also create predispositions towards people and genders. Breaking these biases is a difficult thing and a challenge," Santos said. While many are aware of Unilever’s unstereotype movement which resulted in campaigns such as Dove’s #MyBeautyMySay and Axe’s #IsItOkayForGuys, it’s perhaps less well known that the company ran the movement internally too. "We ran unstereotype at the workplace. We trained people about unconscious bias. About how much they should be conscious about it how we talk biases and how we treat each other," Santos said. And it’s not just about fostering a "nicer" workplace. Santos cited research that proved companies become 20-35% more effective when it becomes more inclusive. "If you’re in a meeting room, and a lot of people are talking and the leader says I would love to hear your point of view... wouldn’t you feel good about it? If you feel that people are listening. Don’t you feel more excited to continue talking? "An inclusive environment can lead to better results. Being inclusive is the outcome of removing bias," she said.